As an iconic area of Greenwich Village, Washington Square has been the focus and battleground of preservation-related controversy throughout the 20th century. Before Washington Square Park was built in 1826, the area was used as a burial ground. The north side was a German cemetery, while the south side was a potter’s field. The area was later used as a public gallows and execution grounds. Between 1829 and 1833, a row of houses was built along the north side of the square. These Greek Revival style houses, built of red brick in a Flemish bond, became known as “The Row.” The entrances are flanked by Ionic and Doric columns and have marble balustrades. By the end of the 19th century, the north side of Washington Square continued to attract wealthy and leading citizens, while the south side was populated with immigrants living in tenement houses. The buildings are architecturally rich and historically significant, and give the neighborhood its unique and distinct character. The New York City Landmarks Preservation Commission designated Greenwich Village as an historic district in 1969. 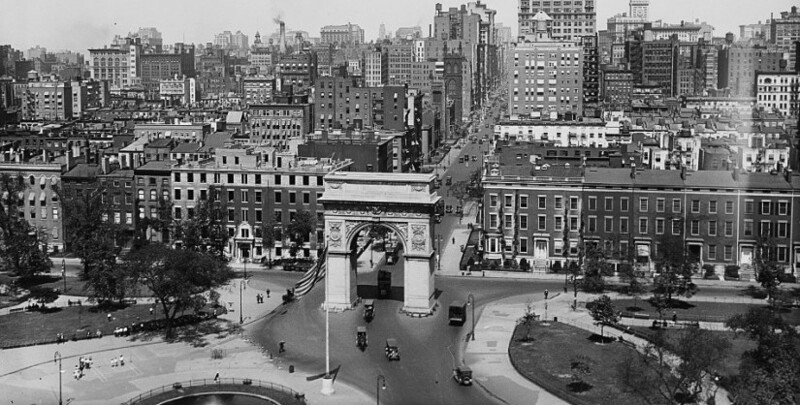 In addition, the Washington Square Arch in Washington Square has been designated a New York City Landmark. Washington Square continues to be a hotbed of preservation activity and controversy. 1936: Sailors’ Snug Harbor, one of the largest owners of land in Greenwich Village, announces a plan to demolish several of the structures facing the north side of Washington Square, east of Fifth Avenue. These structures that lined this block were commonly referred to as "The Row." 1939: Sailors' Snug Harbor decides to retain the architectural character of "The Row"
1944: The Washington Square Association launches a planning effort intended "to preserve the residential character of the Washington Square and Greenwich Village sections of Manhattan"
1947: Robert Moses proposes the "Rogers Plan"
1947: Villagers such as Bishop William T. Manning engage in efforts to save "Genius Row"
May 2006: The court hearing for the case Greenberg v. City of New York is held. The court rules against the Parks Department and in favor of Washington Square Park. Throughout the 1950s, Washington Square continued to be a preservation battleground.26 However, it was not until 1969 that the New York City Landmarks Preservation Commission designated Greenwich Village as an historic district. In 1970, Washington Square Park was renovated by the community. In 1982, Parks Commissioner Gordon J. Davis announced that a redesign plan was in the works for Washington Square. The plan sought to convert the sunken plaza area into its pre-1970 state of grassy land. Several groups, such as Friends of Washington Square Park, founded by Evelynne Patterson, arose to oppose this change. The redesign plan was rejected. In 1991, the renovation of Washington Square Arch began. Furthermore, the following associations and societies have been related to the preservation of Washington Square: Downtown Community Association, Friends of Washington Square Park (1980s); Greenwich Village Society for Historic Preservation; Joint Emergency Committee to Close Washington Square Park to Traffic; Open Washington Square Park Coalition (2007); Save Washington Square Committee (1930s battle); Volunteer Committee for the Improvement of Washington Square (1930s battle); Washington Square Association; Washington Square Park Committee (1950s battle); Emergency Coalition Organized to Save Washington Square Park (2007 Battle). Access to the Shirley Hayes Papers is open to qualified researchers only, and permission to quote from the collection in a publication must be requested and granted in writing. A finding aid, created by Tiffany Schureman, is available at the New-York Historical Society. ”Summary by Keiko Cervantes,” New York Environmental Law and Justice Project 26 February 2016. Emily Kies Folpe, It Happened on Washington Square (Baltimore: Johns Hopkins University Press, 2002), pages 280-283. Anthony C. Wood, Preserving New York: Winning the Right to Protect A City’s Landmarks (New York: Routledge, 2008), page 170. ”Park Plan Voted by Washington Square,” The New York Times, 11 October 1939. ”Moses Drops Plan for Village Park-Residents of Washington Square Section Conducted Long Fight on $600,000 Project,” The New York Times, 29 February 1940. Lindsay Miller, “Whose Park is it Anyway? The Evolution of Preservation Advocacy, Case Study: Washington Square Park,” Unpublished thesis. Columbia University, May 2007, page 48. Anthony C. Wood, Preserving New York: Winning the Right to Protect A City’s Landmarks (New York: Routledge, 2008), page 183. ”New Group Pledges Fight Against Washington Square Road,” New York Post, 28 March 1958. ”Move to Preserve Washington Square,” The New York Times, 27 April 1926. ”The Row,” The New York Times, 3 May 1939. Anthony C. Wood, Preserving New York: Winning the Right to Protect A City’s Landmarks (New York: Routledge, 2008), page 173. ”Plan is Outlined for Village Area,” The New York Times, 1 October 1946. ”Fight N.Y.U. Building on Washington Square,” The New York Times, 24 September 1947. John A. Bradley, “New 19-Story Village Apartment to Have Old-Style Front on Square,” The New York Times, 4 March 1951. Anthony C. Wood, Preserving New York: Winning the Right to Protect A City’s Landmarks (New York: Routledge, 2008), page 175. Anthony C. Wood, Preserving New York: Winning the Right to Protect A City’s Landmarks (New York: Routledge, 2008), page 176. Richard H. Parke, “N.Y.U. Seeks to Add a Wide Area Northeast of Washington Square,” The New York Times, 11 January 1949. Richard H. Parke, “N.Y.U. Will Start Evictions Today,” The New York Times, 25 January 1949. Anthony C. Wood, Preserving New York: Winning the Right to Protect A City’s Landmarks (New York: Routledge, 2008), page 182. Lindsay Miller, “Whose Park is it Anyway? The Evolution of Preservation Advocacy, Case Study: Washington Square Park,” Unpublished thesis. Columbia University, May 2007, page 143.